Location: at Vertical Ballroom, 3rd Floor, MYATT Beach Hotel Pattaya. 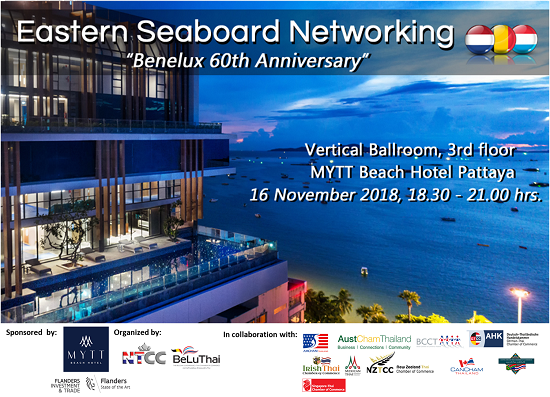 BCCT members are invited to attend the Multi-Chamber Eastern Seaboard Networking "Benelux 60th Anniversary" organised by Beluthai/NTCC. Deluxe Urban THB 3,500 net per room per night inclusive of breakfast for 2 persons. Deluxe Ocean THB 4,000 net per room per night inclusive of breakfast for 2 persons. For reservation please contact Khun Rachan Buathin, Sales Manager via email: rachan@mytthotel.com Tel +66 (0) 8 8538 7098.